In this series about USB duplicators I will show you different models & brands and where to buy them. Especially for those of you who are into cloning lots of flash drives or would like to get there. Why? Well, maybe you desire to promote your marketing material, get your employees or co-workers on the same page or need to rollout a new IT project. Maybe you’re a musician and find it more hip to distribute your art on USB albums instead of old-fashioned CDs. Likewise, teachers can assign projects to their students this way and also copy their work back to the master flash drive. Simply put, USB duplication is great for backups and content providers of all types. Think about it – who would want to sit at their computer and manually copy one flash drive after another, spending lots of time plugging in & out and possibly deal will all sorts of errors? 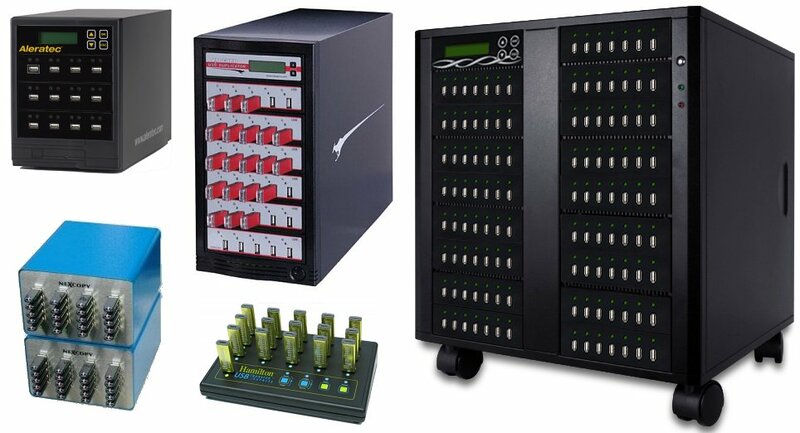 USB duplicators fully automate the copying process, swiftly and accurately. And best of all, most of the models are standalone which means you wont even need a computer. If your cloning projects are rather complex though, a PC connected duplicator with the accompanying software has its advantages. Most USB duplicators can do more than just mere copying. They can also compare, verify, format and erase. And some come with internal hard disks which provide extra memory and help with project storing.